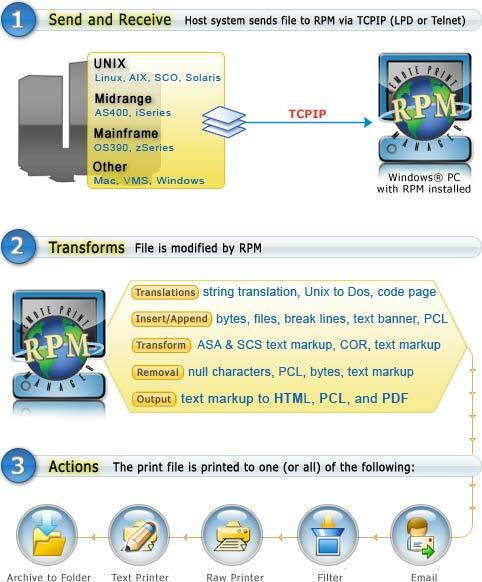 RPM Remote Print Manager® is a PC-based TCP/IP print server (LPD) for Windows platforms that enables users to effortlessly receive customized print jobs from an AS/400, mainframe, or Unix system. RPM offers localized network printing control and flexibility including custom text formatting options for forms printing, label printing, etc. RPM will take output from any LPR and print it on any Windows based printers. Using OctoTools, an optional component from JBM Systems, Inc, any RPM server can convert the line printing to Adobe PDF, the standard for portable documents over the Internet. RPM printing queues allow various manipulations to the print output. End-users have control over fonts, margins, line wrap, printer setup, and a variety of other print features sought by mainframe users such as suppressing trailing blank pages, and scaling down the font to support a given line length. With RPM, you have the flexibility to print data from across the world, or even from the mainframe down the hall! Please feel free to download our Free, fully-functional, 21-day demo of RPM Remote Print Manager. Not sure which version you need? Please check out the RPM main page or read about the differences between RPM Select and RPM Elite Print Servers. Download & try RPM Elite for FREE! New v5.0 Print Server Released! Download & try RPM Select for FREE!